I don’t shoot a lot of landscapes. A scene has to really catch my eye before I am interested in making a photograph to capture it. Most landscape photography is shot with the camera on a tripod, the scene carefully framed and exposed, often while waiting for just the right time of the day. This is an unusual landscape photograph because it was a spontaneous “grab shot.” Not the ideal way to photograph a landscape at all! 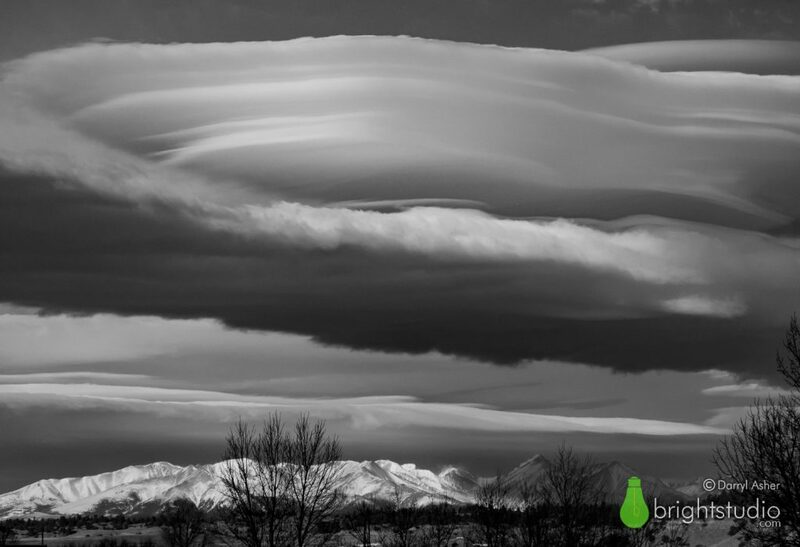 Crazy Mountains, Montana – 13×19 inch black and white print produced on archival, museum quality materials. I was on a road trip with friends, going from Billings to Bozeman, Montana. This spectacular lenticular cloud came into view, so I grabbed my camera, quickly adjusted my settings, framed the image, and shot through the windshield while traveling 75 miles an hour. I got about 10 shots off before the scene was behind me. I wasn’t sure if I would get a good image with the speed and potential for distortion of shooting through the windshield, so I was pleasantly surprised with the results. I converted the image to black and white to emphasize the shapes and tones and to give the image a more ominous look than a blue sky would have. I often struggle with inspiration. This is common for any creative endeavor. Writers can’t think of a story; painters don’t know what to paint, and photographers don’t know what to shoot. But one of the best things that happens to photographers is that we learn a different way of seeing the world, making photographs in our minds before ever clicking the shutter. And sometimes without ever clicking the shutter! A scene like this is an obvious candidate for photography, but there are endless seemingly mundane scenes and events around us all the time that can be made into an interesting and inspiring photograph. The hard part is being tuned in enough to see them. This print is available in the shop.